Amanda Wendling - Making It Up As I Go: Eat Happy. Be Well. We've had our first round of visitors these past few days and we've had a blast. For the most part, we stuck to our itinerary and experienced Portland to the fullest. We laughed hard, experienced good food and drinks, soaked up scenery and enjoyed quality time that is too sporadic these days. In short, we followed some wise Portland advice; Eat happy. Be well. First stop? Downtown Portland, an art museum and a dinner party to celebrate another year in the life of Andrew Forsyth. Day 2? The Columbia River Gorge! Day 3? The Shamrock Run. My arms must have been too tired for additional pictures this day but trust me when I say that we were well. 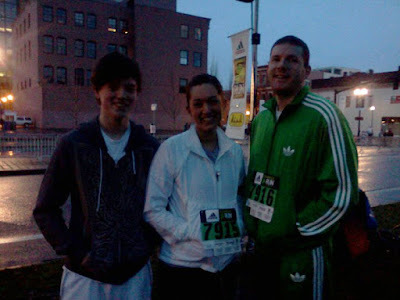 We were well with beers in our hands at the finish line and laughter surrounding us at brunch following the race. ﻿Day 4 found us heading to the coast and soaking in more scenery (and cheese?). And so a flight will head out of Portland tomorrow with our visitors in tow. Our hope is that the laughter stays locked in our house, the memories in our hearts and the message of Portland in theirs.